Before his departure Roberts had offered to Finden Brothers the right of first refusal to publish his drawings. Upon his return Finden would not commit to the project, however, and so Roberts began the search for an alternate publisher. Roberts was insistent that the prints be produced in folio size (about 16" x 20") using the double tintstone method with hand coloring added. Using this technique would require the production of at least three large lithographic stones per print, with each stone drawn separately to take a different ink color. Careful positioning of the prints on each of the stones was critical to ensure that the colors would overlap and blend precisely (hence the tiny pinholes in the corners of the Standard Edition ("SE") untrimmed prints - left over from the pins used to hold the prints in place over each stone during printing.) Hand coloring would then be added to each of the Royal Subcription Edition ("RSE") lithographs. This made the undertaking very expensive, with the cost of production estimated at approximately $350,000 in today's currency. Roberts refused to consider a number of offers to create more modest publications, and for seven months after his return considered how best to accomplish his vision. Finally, in February of 1840 he signed a contract with Francis Graham Moon, who agreed to hire the finest lithographers to work with Roberts, who would in turn receive approximately $100,000, again in today's currency, for the rights to the work. A condition of the contract, however, was that sufficient funds be raised, by advance subscriptions, to cover the cost of production. Roberts and Moon set out to accomplish this by exhibiting Roberts' best paintings and drawings privately to members of the nobility, and publicly through a traveling exhibition. The results were even better than they had hoped - in a little more than a year they received just under 400 advance subscriptions, including Queen Victoria, the Emperor of Russia and the Kings of France, Austria and Prussia, raising more than double the cost of publication. 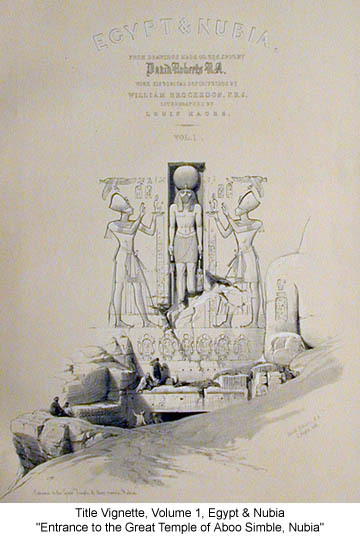 The lithographs were issued in two different versions, both from the same stones. The RSE edition was printed on thin "India" paper, hand colored at the publisher's studio, then trimmed to the image and mounted on a card. The SE edition was printed directly on heavier paper, with a margin all around and a publisher's mark and title below each image. The SE prints would not be originally hand colored.